Traveler Reviews for Private Tour in New York City, New York, United States by Tour Guide Brian F.
TOUR GUIDE RESPONSE: Thank you Lyndon, glad you enjoyed the trip! An absolutely wonderful experience! Our guide (Brian) was amazingly quick to respond to initial request and follow ups were immediate. He sought to find out what our interests were and then developed a tailored route proposal based on what we were most curious to explore - always ready to "adapt" even up to the last minute! We couldn't have been more pleased with our half day with him. He was on time at the designated location and sought to relax us so we could enjoy our day! Would recommend HIGHLY! TOUR GUIDE RESPONSE: Thank you, I'm glad all six of you enjoyed our city so much. Brian was wonderful, we both really enjoyed the experience Brian shared with us. He had a full range of knowledge with every place he took us to. The stories Brian explained were informative as well as emotional, you really get the whole package with him. TOUR GUIDE RESPONSE: Thank you Andie and congratulations on your engagement! We appreciated Brian's flexibility in handling scheduling/location changes. TOUR GUIDE RESPONSE: Not a problem John, always willing to accomodate guests any way I can. Worth every penny/cent! Tour was so interesting that the time just flew by. In fact Brian.F was so good he even managed to keep our teenage children engaged (one of them only looked at their cell phone once during the tour!!). I would whole heartedly recommend doing this tour it was very interesting and Brian was excellent at explaining and answering our questions. TOUR GUIDE RESPONSE: Those are just so very kind comments. I enjoyed my time with the whole family and I hope you guys had a great lunch at Hudson Eats. Brian provided an excellent tour of the WTC and Wall Street area for my husband, two teenage boys and myself. My boys were most impressed hearing the personal stories from 9/11! My husband was also intrigued and impressed learning about the history on Wall Street. The four hour tour flew by quickly! We highly recommend Brian and hope to meet up with him on our next visit to NYC! TOUR GUIDE RESPONSE: Thank you so much for your kind comments Christa, I'm glad you enjoyed the tour. TOUR GUIDE RESPONSE: Thank you Nancy. I Enjoyed the time with you and your family. What a great tour! Brian was so knowledgeable and full of interesting and engaging information. When we come back to NYC we will definitely book another tour with him! TOUR GUIDE RESPONSE: Thank you so much for you kind comments Heidi. I had a great day with you, your mother and your daughter. Love those three generation tours! Excellent tour of Wall Street and Ground Zero. TOUR GUIDE RESPONSE: Thank you Lou, had a great time with you and Carol, glad you enjoyed your visit as well. We so enjoyed our 4 hour walking tour with Brian. Taking this tour, including the subway, really submerges one in the daily life of New Yorkers. Brian is very knowledgeable and relates to the desires of the persons taking the tour. I would very highly recommend it over the bus tour. Would do it again! Thanks, Brian!! TOUR GUIDE RESPONSE: Wow, thanks Betty. Hope you and Jim had a safe trip home. TOUR GUIDE RESPONSE: Thank you so much Ann, I hope Elizabeth enjoyed her birthday trip. Brian was a fantastic tour guide - his experience in the city he so obviously loves made a day of sight seeing in the HEAT so enjoyable. Traveling with children and teenagers, he was able to tailor the tour to stop when necessary and give information and facts that were interesting and relevant to all ages. He is an interesting and kind man and gives a GREAT tour. We will book him again when we're in the city. HIGHLY RECOMMEND! TOUR GUIDE RESPONSE: Thank you so much Katie, had a wonderful morning with you, your sister and the girls. Great day with Brian. I would highly recommend him. I emailed him prior to our trip to NYC and told him what I was hoping to accomplish for the day. He came up with an itinerary that met all my expectations. He showed up on time to our hotel and helped us navigate the NYC subway so we would know how to get back to our hotel. His knowledge of NYC history is AMAZING. We had a delicious lunch in Chinatown and then he left us at the 9/11 musuem after giving us info about the memorial. A wonderful day! TOUR GUIDE RESPONSE: Thank you so much Lori, I am humbled by your review. Hope you enjoy the rest of the week here in town. Great tour. Very informative, would take tour again on future trips to New York. TOUR GUIDE RESPONSE: Thank you again Angela. It was a great tour and I would gladly use TBL again, as would the others in our party. We were very satisfied with even the weather. Great tour! Very experienced guide who knew a lot about the history and events of the area. Was well worth the cost - highly recomend it. TOUR GUIDE RESPONSE: Thank you Chris, had a great day with Annie and you. So glad you enjoyed the tour and hope you have a great time for the rest of your visit in NYC. 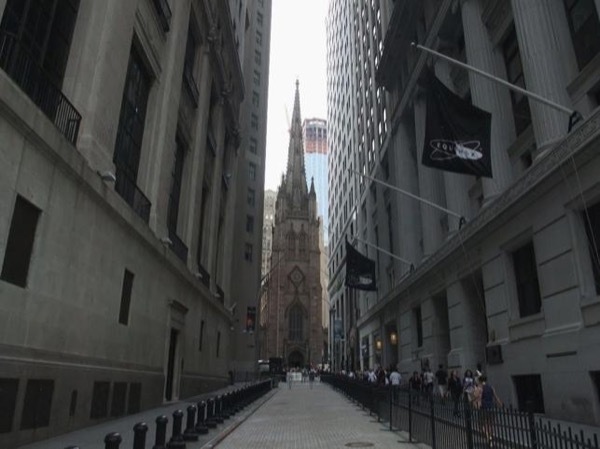 Our Wall Street and 9/11 Memorial tour gave us a wonderful and well informed view of one of the greatest financial districts in the world and one of the sadest places in the world. Brian is passionate about his city, from his reflection into the life of the model, Audrey Munce, to the emotional and moving path across the South and North Ponds of the 9/11 memorial site. Brian later guided us across Battery Park with it's history and evolution. A great informative and moving tour by Brian. TOUR GUIDE RESPONSE: Thank you so much Rod for your kind comments. I had a wonderful time with you also and I hope you enjoyed your remaining time in New York. Today was an exceptional day spent with Brian touring downtown, the Financial District and the 911 Memorial Site. Brian met us at our hotel, guided us through the NYC subway system down to Battery Park. Brian is so knowledgeable about the city he loves that the 4 hours just flew by! Not to be missed is his personalization of two of the many who died on that faithful day of 911! No matter how many times you have been to NYC DO NOT MISS THIS TOUR GIVEN BY BRIAN, it will be the highlight of your trip. TOUR GUIDE RESPONSE: Thank you so much Barbara for your kind comments. I had a wonderful day with you and Tom. Guiding is my pleasure and the company of nice folks like you makes it such much easier. I hope you enjoyed your trip to New York. Brian was an OUTSTANDING tour guide, extreme knowledgeable, very concerned about our wellbeing and how our day was to go. I was traveling with my 80 year old Mother, 70 year old Cousin and my wife who was dealing with back issues. Needless to say patience was a key, Brian made the day special and it was the highlight of our trip to New York! Thanks to ToursByLocals and a special Thanks To Brian! TOUR GUIDE RESPONSE: Thank you so much for your kind words Dennis. I had a fantastic time touring with you and your family. I am so glad you enjoyed our tour together. TOUR GUIDE RESPONSE: Thank you so much for your kind comments. I don't think there is a greater compliment than to say it was like having a relative meet you; I'm just happy you enjoyed the tour! Nice guy, knows a lot about the history and told us his own stories about the place. We could do everything in our own tempo, great time. TOUR GUIDE RESPONSE: Thank you so much for the good review; I had a great time with you and your family and am happy you enjoyed the tour. Brian was excellent - he met us at Penn Station and assisted us with luggage storage - then took us on the subway to the 9/11 Memorial (and he had set up our tickets so we bypassed all the lines, etc) then on to Chinatown, Little Italy, Wall Street, and more - he was a wealth of information and we enjoyed our day with him - he ensured both my friend and I were back at Penn Station and my friend at her stop for her trip back to the airport. It was great to spend the day with a real New Yorker! TOUR GUIDE RESPONSE: Thank you so much for your kind comments Jeannie. I had a wonderful time with you and Diane and only regret we didn't have more time to see more of the city. Very happy everybody got home safe and sound and look forward to seeing you both the next time you are in New York!